During the planning stages of Crossrail it was noted that there was the potential for finding archaeological remains at many sites across the Crossrail route during excavations and other construction works and that works involving ground breaking and excavation had the potential to result in the physical removal of, or the destruction or damage to, archaeological resources. Crossrail undertook an archaeological assessment, covering both above-ground and below-ground archaeological resources, which was reported in the Crossrail Environmental Statement. In addition a technical report on the Assessment of Archaeology Impacts provided detailed information on baseline archaeological resources and potential impacts on them. 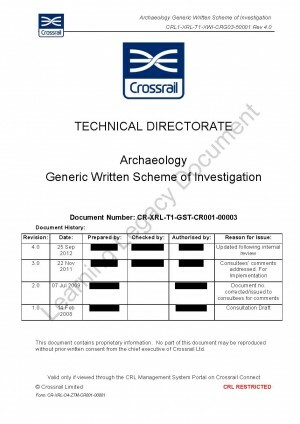 Archaeology was further covered in Crossrail’s Construction Code which requires that all archaeological works must be completed in accordance with the requirements of a Written Scheme of Investigation, which in turn must be based on the principles and methodologies laid down in a Crossrail Generic Written Scheme of Investigation (WSI). The Generic WSI requires Crossrail to implement certain control measures in relation to archaeology before construction work begins and follows the principles of Planning Policy Guidance Note 16 on archaeology and planning, which were agreed with key archaeology and heritage stakeholders such as the local authorities and Historic England.